It seldom happens that certain circumstances do not allow one idea to prosper as planned. But Open Source can solve that issue, once the idea is shared with the world. Others can take on that work, build upon and keep improving it. As they haven’t been able to build it within their targeted timeframe, they announced suspending operations on September 25, 2018. But declaring their designs Open Source is certainly going to help change things for the better. Surely, the Startup had some very noble goals as described in the above video from 2016. But what went wrong? What are the good and bad things out of this news? Let’s discuss. How different is Transatomic’s Design compared to conventional Nuclear Reactors? 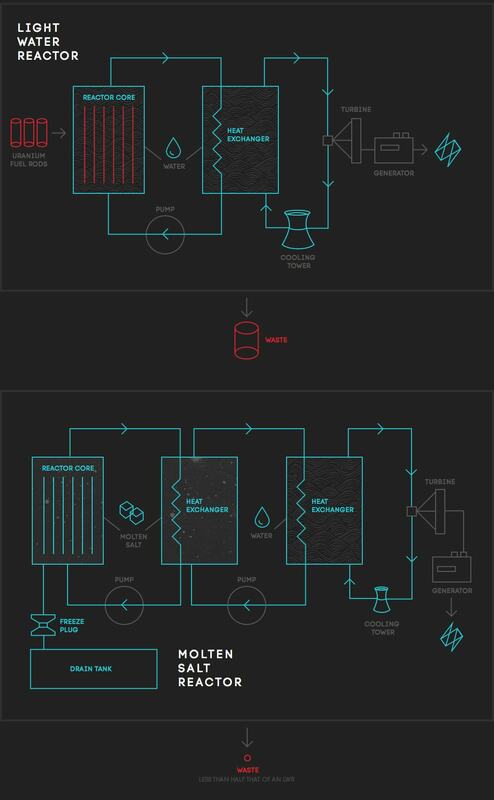 Light-water Reactors use fuel in solid form while Transatomic’s molten-salt Reactors use liquid fuel. This makes easier maintenance possible. Nuclear waste production in this molten-salt design is considerably lower (4.8 Tons per year) than light-water Reactors (10 Tons per year). Significantly safer than light-water Reactors, even in the worst-case accident scenarios. Operates at atmospheric pressure in contrast to 100 times the same in case of light-water, raising expenses for the latter. You can check out their Science (or should we now say, “Open Science”) page where all the above points have been discussed in detail in addition to the white-paper after highlighting significant improvements to the original molten-salt Reactor model. In their assessment paper, we learned about SCALE, a Comprehensive Modeling and Simulation Suite for Nuclear Safety Analysis and Design, homepage located on the Oak Ridge National Laboratory page. This lab is where the first molten-salt Reactor was designed. Why is making an Open Source Nuclear Reactor Design a better step for Humanity? The better scope of consistently improving the models via the scientific community. An Open model is always good news for our environment. Similar or other industries will also be encouraged to adopt such Open measures. “In early 2016, we realized there was a problem with our initial analysis and started working to correct the error,” cofounder Leslie Dewan said in an e-mail response to an inquiry from MIT Technology Review. Would Transatomic have to go through all this had they been Open Source from day one? Clearly no. Most definitely, their initial intention was indeed a noble one! Following are the thoughts from Dr. Kord Smith, who is a professor of Nuclear Science and engineering at MIT and an expert in the physics of Nuclear Reactors. He analyzed the Transatomic Nuclear Reactor design in late 2015. Smith stresses that the founders weren’t acting in bad faith, but he did note they didn’t subject their claims to the peer-review process early on. One critical thing considering the above two principles is that the newly available open resources from Transatomic will help address the issue of Nuclear waste production and innovate ways to reduce it. Though it is sad that the company is shutting down, a new addition to the Open Science community is certainly great news for Open Research Practices and we are much glad about the later development. Their Open Source page is now titled “Open-sourcing our reactor design, and the future of Transatomic”. Considering the latter part of this title, can we expect more Open Designs from them in the future? Have a feeling that we haven’t yet seen the last of Transatomic Power! Do you agree they should have followed an Open Source Approach from the beginning itself? Do you like their new approach and improved design? Feel free to share your thoughts in the comments below. Thanks for the article :) I really hope this model of Open-Sourcing leading edge research results in quicker (and safer) from brain-to-market innovations. Thank you for sharing your thoughts, Albert. I agree with you completely. More of such initiatives are much needed for better Open Science practices in the industry to create greater trust among consumers. Couldn’t agree more! Its really good to know about the Tesla towers in Russia in recent news. The only good thing about this news in here is that the designs are now open and hopefully the existing nuclear designs would at least be replaced to get toxicity to the minimum, if not replacing them with a Tesla tower instead! Nikola Tesla demonstrated this over a hundred years ago that’s where the real research should go but there’s no profit in free and it’s all about money (greed), so we’ll just have to keep paying through the nose!! !